Aim: The present study was undertaken to evaluate the effect of alternative pulpotomy agents such as glutaraldehyde and ferric sulfate on the shear bond strength of self-etch adhesive systems to dentin of primary teeth. Materials and Methods: Eighty human primary molar teeth were sectioned in a mesiodistal direction and divided into experimental and control groups. Lingual dentin specimens in experimental groups were treated with glutaraldehyde and ferric sulfate. Buccal surfaces soaked in water served as control group. Each group was then divided into two groups based on the adhesive system used: Clearfil SE Bond and Adper Prompt L-Pop. A teflon mold was used to build the composite (Filtek Z-250) cylinders on the dentinal surface of all the specimens. Shear bond strength was tested for all the specimens with an Instron Universal Testing Machine. The failure mode analysis was performed with a Scanning Electron Microscope (SEM). Results: The results revealed that glutaraldehyde and ferric sulfate significantly reduced the shear bond strength of the tested adhesive systems to primary dentin. Clearfil SE Bond showed much higher shear bond strength than Adper Prompt L Pop to primary dentin. SEM analysis revealed a predominant cohesive failure mode for both adhesive systems. Conclusion: This study revealed that the pulpotomy medicaments glutaraldehyde and ferric sulfate adversely affected the bonding of self-etch adhesive systems to primary dentin. The pulpotomy technique has been the procedure of choice for treating vital primary and young permanent teeth with carious exposures. The objective of this technique is the removal of inflamed and infected coronal pulp tissue and the application of an effective and compatible bactericidal medicament which encourages the tissue in the root canals to remain vital. Formocresol was the most widely accepted fixative agent for the pulpotomy procedure in primary teeth. Nonetheless, recently a number of problems such as postoperative systemic transport of the medicament, possible effects on the enamel of the succedaneous teeth and the possibility of reversible fixation leading to autoantibody formation have been identified with the application of formocresol. In order to avoid these harmful effects of formocresol, alternative agents for vital pulpotomy procedures are being sought. Glutaraldehyde because of its better tissue fixative property and a superior cross linking ability has also been advocated as a possible substitute for formocresol in primary teeth.,, Recently a non-aldehyde chemical, ferric sulfate has received some attention as a pulpotomy agent. Ferric sulfate is a hemostatic agent and it is thought that the iron and the sulfate ions chemically react with the blood proteins, causing them to agglutinate and form plugs over the capillary orifices., Traditionally pulpotomized primary teeth have been recommended to be restored with stainless steel crown which requires the removal of sound tooth structure not directly involved in the decay process, thereby resulting in increased susceptibility to tooth fracture and also provides no esthetic solution to the clinical problem. With the development of successful dentin and enamel bonding agents, studies have demonstrated that a bonded restoration of endodontically treated primary and permanent teeth strengthens the remaining tooth. Previous studies have shown that the cresol component of formocresol diffuses into dentin canals, reacts with free radicals and inhibits polymerization of monomers in adhesive materials, leading to a reduction in the bond strength of the adhesives and thus adversely influences the post pulp therapy restoration., However due to paucity of studies which have evaluated the biochemical effects of newer medicaments like glutaraldehyde and ferric sulfate on the bond strength of post endodontic adhesive restorations in primary teeth, this study was undertaken. Group I (Control group): 80 buccal dentin samples were soaked in distilled water for 48 hours followed by rinsing with tap water for 15 seconds and blown dry with compressed air for 5 seconds. Experimental groups (Group II and Group III): The 80 lingual dentin samples of 40 molars were equally divided into two groups for immersion regimes in 2% glutaraldehyde (prepared from 25% stock solution by diluting it with phosphate buffer of pH 7.1) and 15.5% ferric sulfate (Astringedent, Ultradent products, USA). Group II: 40 lingual dentin samples were soaked in glutaraldehyde for 48 hours followed by rinsing with tap water for 15 seconds and blown dry with compressed air for 5 seconds. Group III: 40 lingual dentin samples were immersed in ferric sulfate for 48 hours followed by rinsing with tap water for 15 seconds and blown dry with compressed air for 5 seconds. Each of the above groups was then equally divided into two sub-groups based on the bonding agent used, which was applied according to the manufacturer's instructions as follows: Sub group A - Adper Prompt L Pop (3M ESPE. Germany) and Sub group B - Clearfil SE Bond (Kuraray Medical Inc. Japan). A Teflon mold was used to build the composite (FILTEKTM Z-250; 3M ESPE Germany) cylinders on the dentinal surface of all the samples, measuring 2 mm in diameter and 3 mm in height, in a two layer increment technique. Each layer was light cured for 40 seconds using a light cure unit separately. All specimens were left undisturbed for 30 minutes and then stored in distilled water at room temperature for 24 hrs. The shear bond test was performed using a Universal Testing Machine (Instron, USA) at a cross head speed of 1 mm per minute in a compression mode using a blade parallel to adhesive interface between adhesive (Clearfil SE Bond/ Adper Prompt L Pop) and dentin [Figure 1]. The values obtained were calculated in Mega Pascal (MPa) according to area of adhesion and subjected to statistical analysis using unpaired t-test. The samples were observed using Scanning Electron Microscope (SEM) to identify the mode of bond failure whether adhesive, cohesive or combination of both (mixed). For all the tests, a p-value of 0.05 or less was considered for statistical significance. Mean and standard deviation values of shear bond strength test are summarized in [Table 1]. On inter group comparison between the mean shear bond strength values of Group I - Group II and Group I -Group III samples showed a statistically highly significant mean difference (P < 0.001) for Adper Prompt L Pop and Clearfil SE Bond. On intra group comparison of the Shear Bond Strength values within each group, the results were statistically highly significant (P < 0.001) in all the groups [Graph 1]-[Additional file 1]. Failure modes for each adhesive system are presented in [Table 2]. SEM study revealed that most of the specimens failed in cohesive mode [Figure 2] with both adhesive systems on primary dentin surface after treatment with glutaraldehyde and ferric sulfate, with the exception of a few failing in the combined adhesive and cohesive mode i.e. mixed failure. In a shear test, the bond is broken by a force working parallel to the tooth surface. In order to exclude the possible influence of different restorative resins on the bond strength, two different bonding systems in this study were used in combination with a similar composite resin. With advances in materials science and technology, present day composites have been made stronger, with increased wear resistance and color stability. Various studies have proved that Filtek Z250, the universal composite with the reliable hybrid technology, has many advantages like long-term clinical experience, excellent abrasion resistance, medium opacity, high fracture resistance, excellent marginal fit, reduced polymerization shrinkage and easy handling over the other restorative materials. Self-etch adhesive systems were used in this study as there is a trend to move away from the older multi-component bonding systems towards more simplified, consolidated adhesives that are more user-friendly. With self etch approach, there is no etching, rinsing and drying step, which reduces not only the clinical application time but also the sensitivity of the technique and the risk of manual errors during the application process. Clearfil SE Bond is a two step "mild" self-etch light-curing adhesive system (pH = 2.0) and consists of a self-etching primer and a bonding agent. On the other hand, Adper Prompt L Pop is single step "strong" self-etching system (pH = 0.4)., Previous studies have reported the mean shear bond strength of Clearfil SE Bond and Adper Prompt L Pop to be in the range of 16.13-17.80 MPa and 6.04-10.20 MPa respectively., Variations in the bond strengths are attributed to the different bondable substrates chosen (whether primary incisors or molars) or the different composite resins used. In our study, the experimental results showed that there was a significant reduction of shear bond strength among the experimental groups when compared with the controls. Previous studies by Baba et al. and Ritter et al. have shown that glutaraldehyde decreases the shear bond strength of adhesives to bovine dentin. The results of our study are comparable to a previous study conducted by Ritter et al. and Titley et al., who reported that use of glutaraldehyde with adhesives resulted in significantly lower mean shear bond strength values. A possible explanation for the decreased shear bond strength with the use of glutaraldehyde is that the chemical behavior of the glutaraldehyde solution might be influenced as a function of the resin monomers and organic solvents used in the adhesives. There was also a significant reduction in the shear bond strength of ferric sulfate group when compared with the control. Ferric sulfate has been proved to decrease the bond strength of adhesives on primary dentin in a study conducted by O'Keefe et al. and Salama A suitable explanation for reduced shear bond strength associated with ferric sulfate could be the coagulation of collagen or plasma proteins in dentinal fluid which could also affect surface architecture and therefore, bond strength. 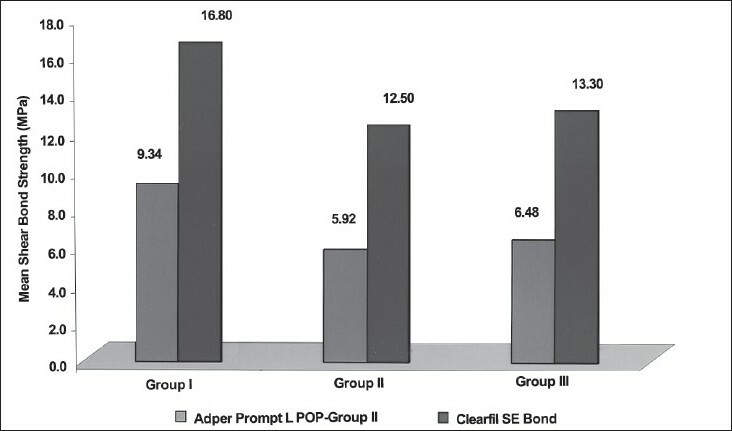 On inter-comparing the two adhesive systems, Adper Prompt L Pop presented statistically lower shear bond strength values than the Clearfil SE Bond on dentin of primary molars. These results are in agreement with the previous studies by Miranda et al. and Atash and Abbeele. The suitable justification of these results is that the solvent of Adper Prompt L Pop is water, which may have influenced its performance, owing to its difficulty in removal and the fact that it could remain within the adhesive interface. In contrast, Clearfil SE Bond has as its solvent ethanol, which is easily removed from the dentin surface by evaporation. Clearfil SE Bond composition has also 10-MDP (10-methacryloyloxydecyl dihydrogen phosphate) which seems to be able to adhere to the remaining calcium of hydroxyapatite. Moreover, Clearfil SE Bond is considered a filled adhesive while Adper Prompt L Pop is unfilled, which makes the latter less resistant to mechanical loads. Scanning Electron Microscopy (SEM) evaluation of the failure mode after shear bond strength testing showed a predominance of cohesive failure, primarily of the adhesive systems, on dentin surfaces. These results are in accordance with the previous studies by El-Kalla and Garcia-Godoy and Miranda et al. These Scanning Electron Microscopy (SEM) images mainly revealed failure within the bonding resin and dentinal tubules filled with resin tags or covered by an adhesive layer. However in a recent study by O'Keefe et al., they found no correlation between the mode of bond failure and bond strength values. Hence no correlation between mode of bond failure and bond strength values was attempted. Available data indicates that when used with self-etching adhesives, pulpotomy medicaments can negatively affect bond strengths to primary dentin. Hence it is prudent that the clinicians explore alternative bonding systems to be used in conjunction with resin composites during post endodontic procedures following pulpotomy procedure using these medicaments. Pulpotomy agents (glutaraldehyde and ferric Sulfate) adversely influenced the shear bond strength of self-etch adhesive systems to primary dentin. Clearfil SE Bond showed much higher shear bond strength than Adper Prompt L Pop to primary dentin after treatment with glutaraldehyde and ferric sulfate. Scanning Electron Microscopic analysis revealed a predominant cohesive failure mode with both adhesive systems on primary dentin after treatment with glutaraldehyde and ferric sulfate. Within the limitations of the study, it was concluded that the pulpotomy medicaments glutaraldehyde and ferric sulfate adversely affected the bonding of self-etching adhesive systems to primary dentin. The clinician should cautiously use self-etching adhesive systems on pulpotomized teeth, unless extrapolated with further supporting studies. Until such time, it is prudent that the practitioners use the more conventional, time-tested post endodontic restorative materials. Further long-term clinical studies are needed to evaluate the influence of pulpotomy medicaments on the bond strength of other current adhesive systems on primary dentin to achieve consistent clinical results. For the long-term success of pulpotomized primary teeth, the pulpotomy medicaments should not decrease the bond strength between dentin and adhesive filling materials. Pulpotomy medicaments glutaraldehyde and ferric sulfate adversely affected the bonding of self-etching adhesive systems to primary dentin. The clinician should cautiously use self-etching adhesive systems on pulpotomized teeth, unless extrapolated with further supporting studies. Until such time, it is prudent that the practitioners use the more conventional, time tested post-endodontic restorative materials. 1. McDonald RE, Avery DR, Dean JA. Dentistry for the child and adolescent. 8th ed. St. Louis: Mosby; 2004. p. 204-35, 388-412. 7. Srinivasan V, Patchett CL, Waterhouse PJ. Is there life after buckley's formocresol? Part I: A narrative review of alternative interventions and materials. Int J Paediatr Dent 2006;16:117-27. 8. el-Kalla IH, Garcia-Godoy F. Fracture strength of adhesively restored pulpotomized molars. ASDC J Dent Child 1999;66:238-42. 16. Miranda C, Prates LH, Vieira RS, Calvo MC. Shear bond strength of different adhesive systems to primary dentin and enamel. J Clin Pediatr Dent 2006;31:35-40. 17. Turkun SL. Clinical evaluation of a self-etching and a one-bottle adhesive system at two years. J Dent 2003;31:527-34. 18. Van Meerbeek B, De Munck J, Yoshida Y, Inoue S, Vargas M, Vijay P, et al. Adhesion to enamel and dentin: Current status and future challenges. Oper Dent 2003;28:215-35. 20. Ritter AV, Heymann HO, Swift EJ Jr, Perdigao J, Rosa BT. Effects of different re-wetting techniques on dentin shear bond strengths. J Esthet Dent 2000;12:85-96. 24. el-Kalla IH, Garcia-Godoy F. Bond strength and interfacial micromorphology of four adhesive systems in primary and permanent molars. ASDC J Dent Child 1998;65:169-76. Ebrahimi, S.F. and Shadman, N. and Abrishami, A.